They’re Running For Attorney General, Secretary Of State And Supreme Court. But Who’s Been Funding Their Campaigns? LANSING (AUG. 22 ,2018) — This fall, Michigan voters will pick a new attorney general and secretary of state. They’ll also fill two seats on the state’s highest court. Candidates applying for the jobs have already combined to raise about $5.4 million. This weekend, the Michigan Democratic Party, the Michigan Libertarian Party and the Michigan Republican Party will hold conventions to officially select their nominees for the four positions and others. The attorney general is the state’s top law enforcement officer. Republican Bill Schuette, who’s now running for governor, currently holds the job. The secretary of state oversees state elections. Republican Ruth Johnson, who is term-limited, currently has that position. The two Supreme Court seats up for election this year are held by Kurtis Wilder and Elizabeth Clement, who were appointed by Republican Gov. Rick Snyder. Both are hoping voters re-elect them. 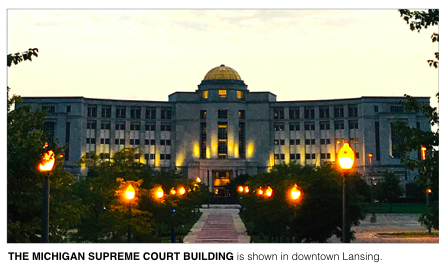 There are seven total seats on the Michigan Supreme Court (justices nominated or appointed by Republicans hold five seats while justices nominated by Democrats hold two seats). The following is a summary of how much money candidates for the positions have raised and who their top six donors have been, according to campaign finance disclosures. As a note, some of the candidates mentioned below have halted their campaigns. Who He is: He is currently the speaker of the Michigan House. Who She Is: She is the managing partner of Nessel & Kessel Law. Who She Is: She is a member of the Michigan Senate. NOTE: He stopped his campaign after the Democrats’ April endorsement convention. Who She Is: She is the former dean of the Wayne State University Law School. Who She Is: She is a member of the Eastern Michigan University Board of Regents. NOTE: He withdrew from the race earlier this month. Who He Is: He is an assistant professor at Michigan State University. He has a waiver from reporting requirements. Who He Is: He is a former principal deputy assistant attorney general for civil rights at the Department of Justice. Who She Is: She is a member of the Supreme Court who previously worked in Gov. Rick Snyder’s administration. Who He Is: He is a member of the Supreme Court who previously served on the Michigan Court of Appeals. Who She Is: She has 15 years of experience as an appellate attorney.